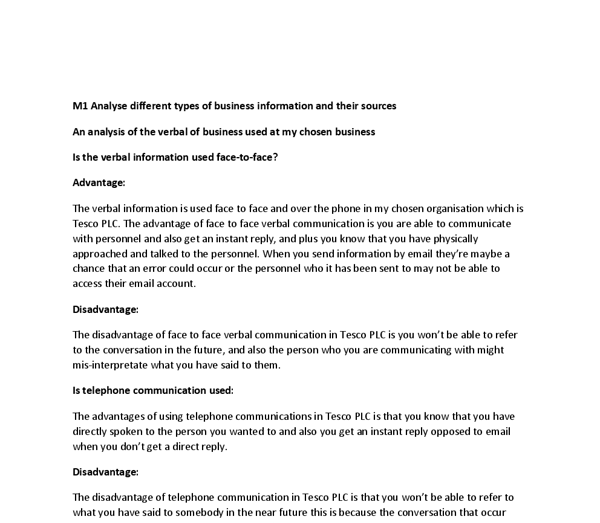 ﻿M1 Analyse different types of business information and their sources An analysis of the verbal of business used at my chosen business Is the verbal information used face-to-face? Advantage: The verbal information is used face to face and over the phone in my chosen organisation which is Tesco PLC. The advantage of face to face verbal communication is you are able to communicate with personnel and also get an instant reply, and plus you know that you have physically approached and talked to the personnel. When you send information by email they?re maybe a chance that an error could occur or the personnel who it has been sent to may not be able to access their email account. Disadvantage: The disadvantage of face to face verbal communication in Tesco PLC is you won?t be able to refer to the conversation in the future, and also the person who you are communicating with might mis-interpretate what you have said to them. Is telephone communication used: The advantages of using telephone communications in Tesco PLC is that you know that you have directly spoken to the person you wanted to and also you get an instant reply opposed to email when you don?t get a direct reply. Disadvantage: The disadvantage of telephone communication in Tesco PLC is that you won?t be able to refer to what you have said to somebody in the near future this is because the conversation that occur internally isn?t recorded only external calls from customers are recorded for personnel preference and reasons Does your business use voice mail: Tesco PLC use voice mails such as pre-recorded voice mails to remind customers of delivery dates and times. ...read more. at looking at the notice board for new notices Emails: Emails are used regularly in Tesco PLC to contact different people and departments that operate within Tesco PLC. The advantage of using emails is that you are able to send receive replies and also keep the emails for future references Disadvantage: The disadvantage of using emails are that you receive a lot of span mail which is very annoying and because of this you might delete a very important email by accident, another disadvantage of emails are that they are very hard to use if you are unfamiliar with the operation of it Leaflets: Leaflets are used in Tesco PLC to present information to customers on the services and products that they provide, the advantage of leaflets are that they present information in depth of the product and services that Tesco PLC offer it also saves time and resources, and also employees don?t have to waste their time to explain to the customer about all the products and services that they provide Disadvantages: The disadvantage of using leaflets are that they sometimes hold more information than required which could lead to customers disregarding the leaflets because they are put off by the amount of information, another disadvantage of leaflets are that they are not made for illiterate personnel, so if they require information on a organisations services or products and they take a leaflet they will be very confused as they won?t understand the leaflets An analysis of on-screen information used by my chosen business organisation: television Tesco PLC is my chosen organisation, they do use television advertisement to present written ...read more. An example of this is Tesco PLC supermarket, they?re administration team will have the invoices and the paper work, they will also have spread sheets showing the amount of incoming and outgoing of the specific supermarket The advantage of administration the will have contact with everybody in the organisation, this also allows then to communicate from remote locations Disadvantage: The disadvantage of administration they could have a technical default External: Government: The government will process laws and regulation that have to be implemented by the organisations if it concerns them. An example of this is Tesco PLC, when the government implied the fare trading, this meant that Tesco PLC weren?t allowed to expand anymore in the UK because they were the market leaders by a substantial percentage compared to their competitors Database: Information an organisation holds on their customers, an example of this is Tesco PLC as they hold information on their customers this information is obtained through their clubcard as it shows the products that customers tend to get, they also obtain the information through seeing which products are the most popular amongst customers Research: Research is how the organisation obtains the information from external sources, an example of this is Tesco PLC as they use external resources and sources to gain information that they will require or is relevant to their organisation, information such as insight on competitor?s tactics and objectives and also promotional tactics that will help them increase their sales Reliability of data sources: If the information that Tesco PLC have is incorrect or invalid, this will affect all the other departments, and because of the information being incorrect and invalid it has also wasted resources Tesco PLC resources ...read more. The reason why Tesco plc will use verbal information is to get the message across other employees quicker and it?s more efficient. For example communicating sales promotion will need to planned SMART and every employee need to know what to do in communicating sales promotion in their organisation. 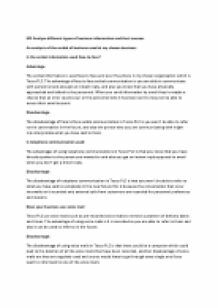 Legibility This refers to the material that makes the business information being communicated to audience easier to read and to properly understand the information being communicated to them. An advantage for Tesco using this method is that the will be in a better position attract customers with the information they communicate to them. When businesses are out of rescission investment will be invested in advertising, this because businesses need to get the message out to consumers that they have the supplies the consumers want. Profit margins should increase since demands are increasing and consumer?s confidences are more confident in purchasing goods. correctly and employees are trained to use machinery to avoid injuries and dangers to health. European Agency for Health and Safety Butchers must ensure that they are providing a safer, healthier a more productive workplace in order to abide by the regulations of the European agency for health and safety. This happens because of the customers in that particular area who shop a lot at later hours in the day or in the night. This is due to the fact that people these people have busy schedule and work all day so the only moment the time to do their shopping is at latter hours.